The saddest thing about the children of today is that ‘we’ think for them that they have enough to learn, and in that process we have no idea where mankind is heading to. 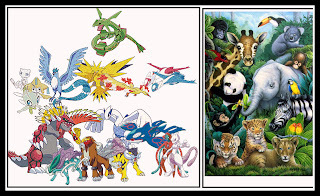 The connection here may not be so obvious but do read this article: Why Conservationists Should Heed Pokemon? We better agree. If we were to show a kid these two pictures, there are high chances that the Pokemon characters will be identified with relative ease. On the other side a giraffe, panda, chimp, lion, tiger or any other living being for that matter will be pretty alien to the little one. There is no getting away from the fact that even most of us adults will fail to differentiate a cheetah from a leopard. I admit I cannot until somebody tells me. Going by the current trends and how matters are right now it does seem like we are close to the point of no return. All in the name of evolution we are too busy learning and doing things, most of which work against the laws of nature. ‘Save Green, Save Wild or Save Earth’ sounds more like ‘Save Mankind’. A fact enough to poke each man on this earth is that most of us are unaware of what exactly makes our environment, its flora and fauna, and our interactions with them and that is where the entire problem begins. Nobody yearns to know. What follows is the blatant ignorance. It all begins right from childhood, regrettably. Think of all the ideas of destruction and doom that we propagate, get excited more than dread about. Take this for some thought, we live in a fictional world which fortunately is very real. All depends on what you choose to show to your kids.When I was a child,we mostly learned form things and events around us.Bu,is it possible now? Yes Sir, thats exactly the point. We are in a new age.